A young David Bauer attended St. Michael's College School where he became a member of the St. Michael's Majors in 1942. Father David Bauer has been described as an inspirational coach, a caring educator, a master motivator and a dreamer. He was devoted to the concept that education and hockey could mix. He viewed hockey as a means to develop a better person. He believed that building men came before building hockey players. "We try to give our players a well-rounded education, not merely ice skills but mental and moral conditioning as well," he told reporters in 1961. "We can't help but be better off in the long run." David Bauer was the third hockey-playing brother to attend St. Michael's College from the family home in Kitchener, Ontario. Bobby, nine years Dave's senior, was part of that school's first Memorial Cup championship in 1934 and went on to be inducted into the Hockey Hall of Fame after an outstanding career with the Boston Bruins. Another brother, Frank, was a bit player with the Majors in 1933-34. On the advice of older brother Bobby, the Boston Bruins had tried to sign David and have him join their newly launched Eastern Hockey League farm team, the Boston Olympics, in 1940-41, but Dave instead chose to attend St. Michael's College School. The family patriarch, Sir Edgar Bauer, had instilled in his sons the idea that playing hockey was fine and good, but only after completing a proper education. Dave took the advice to heart, and became a member of the St. Michael's Majors in 1942. A talented winger, Bauer was named team captain and scored 10 goals and added 11 assists for 21 points in 20 games that season. 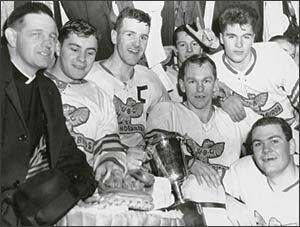 Father David Bauer poses with the Memorial Cup following St. Michael's Majors win in 1961. The next season, Dave, captain of the team for a second year, scored 12 goals and 25 assists in 25 games. The Majors had an excellent team that year, and through the playoffs, Bauer collected 7 goals and 5 assists in 12 games, but it wasn't enough, as the Oshawa Generals eliminated St. Mike's. So impressed were the Generals with the young forward that, when they were allowed to add three players to their lineup for the Memorial Cup final against the Trail Smoke Eaters, they selected Bauer as well as teammates Ted Lindsay and Gus Mortson. Bauer scored 4 goals and 9 points during the seven-game series to help the Generals to the championship. Although he had hoped to help his Majors win the Memorial Cup in 1945 (which they ultimately did), Bauer played but one game for St. Mike's that season. In the latter days of World War II, he enlisted instead and ended up playing hockey with the Windsor Spitfires of the Windsor City Hockey League as well as the Ottawa Canadian Postal Corps of the Ottawa National Defence Hockey League. In 1945-46, having returned from military service, he played with the University of Toronto Blues. David then entered the novitiate of the Basilian Fathers to study for the priesthood. "Dave Bauer was a class act all the way," states John McCormack, a teammate with the Majors. "He could've been a good one. He had more determination than (his brother) Bobby. I played against Bobby, he was finesse. Dave was more grinding, He had all kinds of talent, and when it came to determination, no one was better. He would've made it to the NHL easily if he had wanted to." Brian Conacher adds, "The interesting thing about Father Bauer was that he was a priest first and foremost, but I don't think a lot of people realize that he was also a terrific hockey player. He certainly could have gone on to play professional hockey and likely could have gone on to the NHL. He lived a little bit in the shadow of his brother Bobby, who was a big star with the Boston Bruins and the Kraut Line. But Father Dave chose the cloth and that was the direction he went." David Bauer was ordained as a Basilian priest in 1953 and, a year later, joined St. Michael's College as both a teacher and a coach. 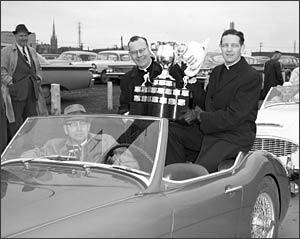 Father David Bauer helped lead St. Michael's Majors to the 1961 Memorial Cup title. Father Neil Hibberd told CBC Radio what it was like to have Father Bauer as a teacher. "In Grade 9, he told us, 'I'll meet you after school on the field. You kick off to me. If you touch me before I return the ball to the goal line, you'll have a week off homework.' So we're thinking, 'Forty of us. We're smart. We're good athletes. Who's this old man?' So he's out there when we came out. He didn't even take his long cassock off. He just tucked the skirt into the belt. We kicked off to him and he ran through all forty of us. Now, how are you going to turn down somebody like that, because he's also telling me about the love of God and how it is to live well, the same guy that can run through forty of his young students? He left a mark on me that I'll never forget. What I wanted to do was to be anything even a little bit like that!" Through the ensuing years, Father Bauer coached hockey at various levels for St. Mike's. He became manager of the Majors and in 1960, following the resignation of coach Bob Goldham, assumed the coaching duties himself. 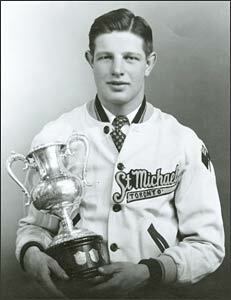 That season, 1960-61, the St. Michael's Majors were awarded the Memorial Cup as junior champions of Canada. Citing the growing conflict between scholastics and the demands presented by long seasons and substantial travel, St. Michael's decided to withdraw from the OHA Junior 'A' hockey program in 1961. Although it had been discussed for several years, few could believe the decision had actually been made, especially with the school basking in the spotlight after the Memorial Cup championship. "Our General Council had talked about this for a long time and they talked to me about it," explained Father Bauer in a 1987 interview. "We (representatives of St. Michael's College School) were always trying to cut down on the violence, cut down on the length of schedules, cut down on the materialism of the whole thing. We regretted very much leaving because we knew that this [school] is a major recreational institution in this country. The 1961 season, I think we played 98 games. At that level and at that pressure, if you really look over the whole history of it, it's amazing the number of boys who did it and survived academically. It was amazing what could be done even with those difficult circumstances. It would have been a good thing to remain to have that moderating influence on the sport, then to have the trickle-down effect and it permeates through." Although little was ever discussed publicly, it appears that Father Bauer accepted the decision begrudgingly, although it is likely no coincidence that the Basilian Fathers assigned him to St. Mark's College at the University of British Columbia in Vancouver in 1961. He served there as chaplain until 1988 and coached the UBC hockey team, the Thunderbirds, in 1962-63, taking them to the Canadian university final. 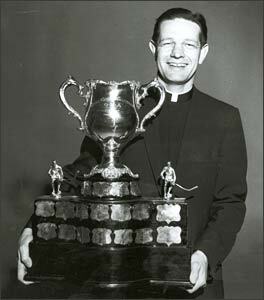 Father David Bauer was assigned to St. Mark's College at the University of British Columbia in 1961 where he served as chaplain until 1988 and coached the UBC hockey team in 1962-63 to the Canadian university final. But Bauer had a vision for hockey in Canada. While attending the World Championship at Colorado Springs in 1962, he conceived of a permanent national hockey team. Canadian Amateur Hockey Association president Jack Roxborough encouraged Bauer to present his idea at the CAHA's annual meeting in Toronto that year. To assure continuity from year to year, Father Bauer envisioned a team stocked primarily with university students, reinforced by a handful of players from the senior ranks. (Olympic restrictions prevented players with experience in the National, American, Western or Central hockey leagues from taking part in the World Championship or Olympic tournaments). The plan was unanimously approved by the CAHA on August 26, 1962, and Bauer was provided with seed money. The CAHA also agreed to provide university fees and money towards room and board for the players, who would be based at UBC. In Jim Coleman's book 'Hockey Is Our Game,' Canada's national team was called "the most nobly conceived of all Canadian hockey enterprises." Father Bauer patterned the National Team after what he had observed at St. Michael's College in the late 1950s and early 1960s. By taking players with some natural ability and instilling good discipline and a strong comprehension of the fundamentals of the game, he felt you could mould a team into a unit that was collectively much stronger than any one of its individual parts. "This was what Father Bauer did with the St. Michael's team when he coached it, and thus gained my respect, not only as a knowledgeable and capable teacher of hockey, but also as an astute, perceptive, and sensitive man," says Brian Conacher. In addition, Father Bauer studied the European teams of the late 1950s that had developed into strong contenders for the World Championship. He found that three nations in particular -- Czechoslovakia, Sweden, and especially the Soviet Union -- had progressed rapidly in the hockey world, while Canada was beginning to lose its grip on hockey supremacy. In 1959, the Belleville McFarlands represented Canada and won the gold medal. In 1960, the Kitchener-Waterloo Dutchmen, coached by Father Bauer's brother Bobby, represented Canada at the Olympic Winter Games, but the United States stunned the hockey world by working their first 'Miracle on Ice.' Canada took the silver medal. The Trail Smoke Eaters won the World Championship in 1961, but in 1962, the Galt Terriers lost to Sweden, and in 1963, Trail lost to the Soviet Union. It became evident to the CAHA officials that the days had come to an end when Canada could send the Allan Cup champion to represent the country at the World Championship and expect to win. "(Father Bauer) was enough of a hockey man to know that you do not build a team overnight," says Conacher. "His goals were to bring the World Championship back to Canada and to show that good hockey players can be good students, and that hockey can grow in conjunction with a continuing education. He saw hockey as an experience that could teach and develop men of character and fibre. Hockey as a game could help teach one how to play the game of life." Father Bauer came up with about forty players from across Canada, including several of his former players from St. Michael's College -- Terry Clancy, Paul Conlin, Gary Dineen, Barry MacKenzie, Billy MacMillan, Terry O'Malley and Rod Seiling. The Toronto Maple Leafs owned the rights to all, as well as Gary Begg, Ken Broderick, Brian Conacher and Ross Morrison. All had chosen to continue their education as opposed to turning professional at the end of their junior careers. Roger Bourbonnais, whose rights belonged to the Detroit Red Wings, had been the captain of the Edmonton Oil Kings and was in law school. "The thing that appealed to me the most about Father Bauer when I came in contact with him was that he was a teacher, and that's what I thought a coach should be," says Conacher, a passionate devotee of Bauer's instructional methods. "I know that had I not played for Father Bauer, I would never have made it to the NHL. He taught me the discipline and the skills that were lacking." 1964 Winter Olympic Games in Innsbruck. The 'Nats' represented Canada at the 1964 Olympic Games in Innsbruck, Austria. 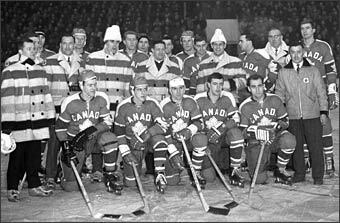 The Soviet Union won all seven of their games while Canada, Czechoslovakia and Sweden each finished with records of 5 wins and 2 losses. "Every player played his guts out and no one will ever be able to say that the 1964 Canadian Olympic Hockey team quit under pressure," maintains Conacher. "The hard fact was that we just didn't have the horses to do the job. The Russians were older, more experienced and had more depth. And when you combined their situation with our inexperience, our youth and our lack of depth, it was a tribute to the excellent coaching abilities of Father Bauer that we were as good a team as we were." In an Olympic match against Sweden on January 30, a Swedish player broke his stick while cross-checking a Canadian player, and while tossing the broken shaft at the bench, caught Father Bauer in the forehead. Loyal Canadian team members were enraged, but as they were about to leave the bench to confront the Swede, Father Bauer issued a terse command that they remain on the bench, and tensions subsided. The next evening, Bauer invited the Swedish player to watch the Soviet-Czechoslovakia game with him. After the tournament was over, the Canadian coach was presented with a special gold medal for exemplary leadership. The tournament was marred by a controversy that continues to rear its ugly head to this day. Brian Conacher tells the story: "While the final game was in progress, and it became evident that there would be a three-way tie for the silver medal, Bunny Ahearne, president of the IIHF (International Ice Hockey Federation), decided to change the rules. He arbitrarily decided that a tie in the final standings would be (resolved) based on goals scored. As a result, Canada was shuffled out of the medals and finished fourth. After being robbed of a medal, Marshall Johnston turned to Father Bauer and said, 'It looks, Father, as if the shepherd and his flock have been fleeced!'" Canada's National Team was transferred to Winnipeg from Vancouver in 1965. Father Bauer's role became that of an advisor while Gordon Simpson, the coach of the Allan Cup-winning Winnipeg Maroons, took over the coaching position. From 1966 to 1969, Jackie McLeod coached the Nats while Father Bauer served as manager. The team brought home the bronze medal at the Olympic Winter Games in Grenoble, France, in 1968, but was sadly outclassed by the Soviet and Czechoslovakian teams, both of whom were able to use their best available players. The IIHF had reneged on a promise to allow teams to use the best available players, professional or not, and because the vast improvement in the European hockey teams made it impossible to compete at the highest levels without the use of professionals, Canada withdrew from international competition on January 4, 1970, and did not return at the senior level until 1977. That certainly didn't mean that Father Bauer was inactive. He continued to act as an advisor to UBC's hockey coaches and players, while also sharing his knowledge with fledgling hockey programs. During this ten-year period, Bauer travelled to Japan for six-week periods twice a year to instruct at hockey schools. It seems probable that Father Bauer's outlook on personal growth through hockey was particularly suited to a Japanese culture that valued discipline. In 1973, Bauer accepted an invitation from the Austrian Ice Hockey Federation to assist with their program. Canada returned to the Olympics in 1980, and Father Bauer served as the team's managing director for the tournament in Lake Placid, New York. "I travelled with Father Bauer and the National Team to Europe and Japan prior to the 1980 Olympic Games in Lake Placid, New York," wrote George Gross in the Toronto Sun. "Bauer instilled dignity in any discussion, whether it was sports, politics or religion." Absence from international competition had severely damaged Canada's program, and the team finished sixth, well behind medallists USA, the Soviet Union and Sweden. In 1981, Father Bauer was appointed vice-president of Hockey Canada and chairman of the country's Olympic hockey program, and continued to teach at St. Mark's. He also continued to assist with the UBC hockey team. 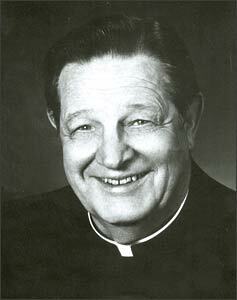 On November 9, 1988, just a week after his 64th birthday, Father David Bauer succumbed to cancer in Goderich, Ontario. "Canada has lost a man who was extremely loyal to the ideals of amateur hockey," said Terry O'Malley. In 1989, Father David Bauer was inducted posthumously into the Hockey Hall of Fame in the Builder category, and was added to the IIHF Wall of Honour in 1997. In the years before his death, a multitude of honours had been bestowed on Bauer, acknowledging his importance to the game of hockey. He received the Order of Canada in 1967; had an arena in Calgary, which serves as the home base of Hockey Canada, named in his honour in 1986; and scholarships in his name are awarded at both St. Michael's College and at the University of British Columbia. In 1989, Father Bauer was posthumously inducted into the Hockey Hall of Fame in the Builder category, and he was added to the IIHF Wall of Honour in 1997. But there can be no greater honour than the respect earned from the players whose lives he touched. "Father Bauer was very involved in the mental, physical and spiritual well-being of all his players," recalls Brian Conacher. "He truly was like a father to this whole group of guys. He was a very inspirational kind of coach. He left an indelible mark on every young man that he came in contact with." Rod Seiling reflects on his coach with both St. Mike's and the National Team. "He was well-versed in hockey and well-versed as a person. He had very strong views on how to play the game. Bauer had the ability to take the elements -- checking, skating, shooting -- and mold a team. It didn't have to be the most talented team to be very competitive because of his ability to take a team that worked very well together using those basics." The accolades to an outstanding individual conclude with Jim Gregory. "Father Bauer put me on the hockey path and I am truly indebted to him. My dream was to be involved with Junior hockey and I never imagined that I would get to work in the NHL, much less be an Honoured Member of the Hockey Hall of Fame." To Father David Bauer, it all came down to one sentence: "If you can improve the boy as a person, you will improve him as a hockey player."